It is interesting to have the pioneer of the R2P concept try to distance its implementation from the most pressing humanitarian crisis of 2013. I wonder how much it has to do with Annan’s failure at mediation of the conflict, or his desire to one day in the future work with Russia and China on a major issue. Interestingly, he cited his work in Kenya during the post-election violence in 2008 as the most successful of R2P. 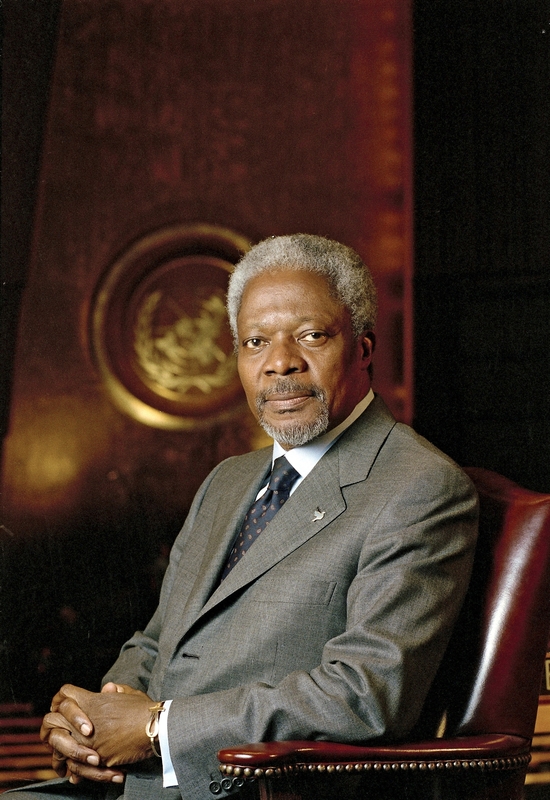 While I had never heard of it cited as an example, but here’s a great interview that gives the same argument the Annan gave for R2P in Syria and cites Kenya as a success story. And here are a few more that use Kenya as a success story for R2P. His typically diplomatic answers were the bulk of the Q&A with Laure Ling, the moderator. He gave few specific or detailed prescriptions for a variety of issues. Surprisingly, even the question of what should students be doing to prepare themselves to be global citizens received a vague answer: “…have a dream. If you don’t dream, you cannot begin”. While a very nice philosophical quote, it gives little help to the future UCLA graduates who are seeking to engage the world and fix the issues that we see to be impacting our world. I was curious to see if he would speak on the recent op-ed he penned, and the broader topic of mining transparency. He mentioned it briefly, but no specific numbers, only to say that the amount lost to bad mineral deals or illicit sales was twice the amount of aid to the continent (In his NYT op-ed, he notes that ‘transfer pricing’ that costs the continent 34 billion a year). He also mentioned the DRC, but made no note of the UN Mission in the Congo, nor the coming South African intervention. He noted the DRC when asked what are the issues in threatening global peace (he first listed the Middle East, then Pakistan, then the DRC), but said that the ‘issues’ such as Climate Change were the things that kept him up at night as UNSG. His other major ‘issue’ was that of youth unemployment. He said that very few governments ask what their policies do for unemployment and highlighted the efforts of Germany and Switzerland who have devoted resources to vocational training. Seems a bit too easy to highlight major economic powers as a model for the rest of the world. It would’ve been interesting to hear what his opinions were on the youth bulge in Africa and how international organizations can play a role in educating, employing, or engaging that population. Overall, his talk was a generic speech for someone who follows intenrational affairs. I wish he had expected the audience to already know the main talking points for things like Syria, Climate Change, women in politics, North Korea, reducing pharmaceutical costs for HIV/AIDS drugs, and unmanned drones. His experience on the front line of international affairs would surely give him more insight into the issues and dilemmas facing top policy makers. However, only once did he hint at the politics and discussions that go on behind the scenes when he led off his talk with his work on reforming the UN. But this should have been expected, Kofi Annan is a diplomat’s diplomat – not saying anything that would offend any of the parties, sticking to the universal talking points, and by giving vague and philosphopical advice on addressing the key issues of the day. Makes you wonder what the real Kofi Annan is like behind closed doors! This entry was posted in International Relations and tagged Kenya, kofi annan, leadership, r2p, syria, ucla, united nations by Alex Laverty. Bookmark the permalink.